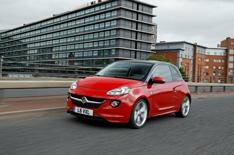 Vauxhall reveals three-cylinder Adam | What Car? Vauxhall will unveil an all-new high-tech 1.0-litre threecylinder petrol engine at next month's Frankfurt International Motor Show, and the first car it will appear in is the Adam supermini. The 1.0 turbo produces 113bhp and 122lb ft of torque, and is linked to an all-new lightweight six-speed gearbox. No figures have yet been released, but sub-100g/km CO2 emissions are likely. Vauxhall claims it has worked hard to eradicate the 'thrum' that is a consequence of the three-cylinder configuration, and says that the new engine will be more refined than any other three-cylinder engine and also quieter than many four-cylinder engines. The company also says the engine will be not only extremely efficient and cheap to run, but will also be good fun to use. The Frankfurt motor show runs from September 10-22.